We are pleased to announce another success of VTS Poland. By Decision of the Military Centre for Standardization, Quality Assurance and Codification, VTS Poland Sp. o. o. has obtained the NCAGE certificate (NATO Commercial and Government Entity) with code number 3288H. The code identifies the company in the NATO Codification System (NCS). 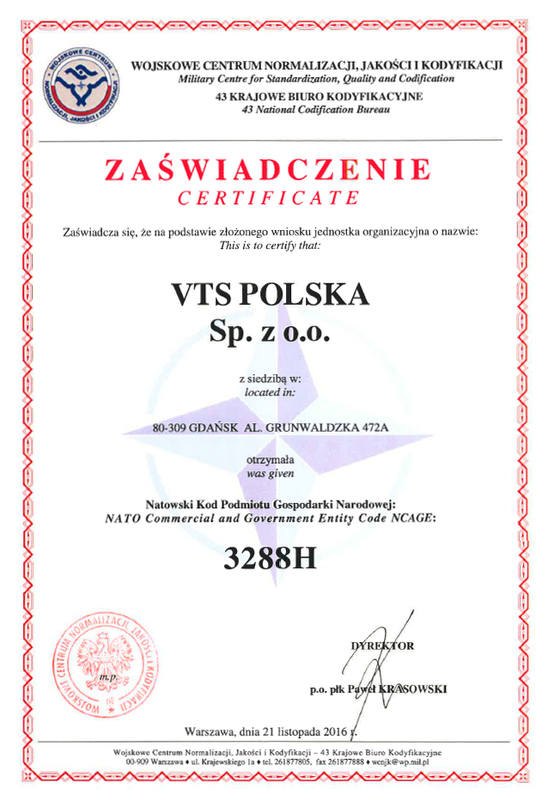 The certificate confirms that VTS Poland meets the standards set by NATO for suppliers of products and services. As part of the certification, the company’s data have been entered in the National Register of Economic Entities in the NCS system and will be published in the NATO Base of National Economy Entities contained in NATO Master Catalogue of References for Logistics (NMCRL). The certificate is available on our website. Please click here.